The apple season is upon us and what better way to celebrate than with these delicious spiced apple bars. Dulce de leche and spiced apples are sandwiched between two layers of oat-y crumble biscuit. 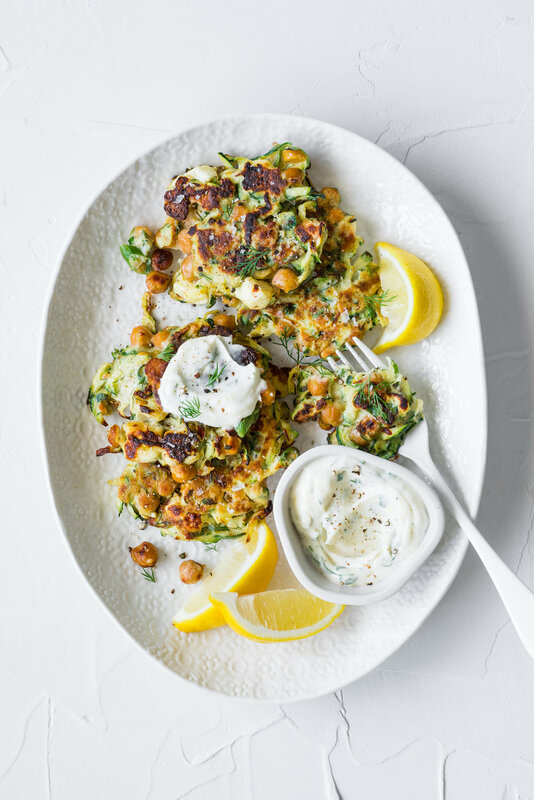 Herby zucchini and chickpea fritters served with a zingy lemon and chive mayonnaise. Grill on a barbecue flat plate or in a non-stick frypan. Great as party food or alongside a green salad as a main. One of the most memorable meals I ate while travelling around Mexico was a spicy barbecue chicken served with baby potatoes, jalapeños and soft corn tortillas. The chickens were cooked on a rotisserie barbecue with a bed of new potatoes roasting underneath. The spicy chicken juices dripped down onto the potatoes making them incredibly flavourful and soft. This is my take on that delicious meal, cooked on the barbecue using Wilcox Baby Perlas Potatoes. A great accompaniment to any barbecue, this vibrant summer salad is packed with flavour. Lime zest gives the mayo dressing a real zing! Soft and fluffy dough baked with layers of cheese, garlic and fresh herbs. Inspired by Ottolenghi’s Babka and supermarket pull-apart twists, this cheesy loaf is seriously tasty. As a kid I was totally obsessed with those sauces that harden within seconds of touching your ice cream. They are so easy to make at home and require very few ingredients. I’ve jazzed this one up a bit with peanut butter and sea salt. 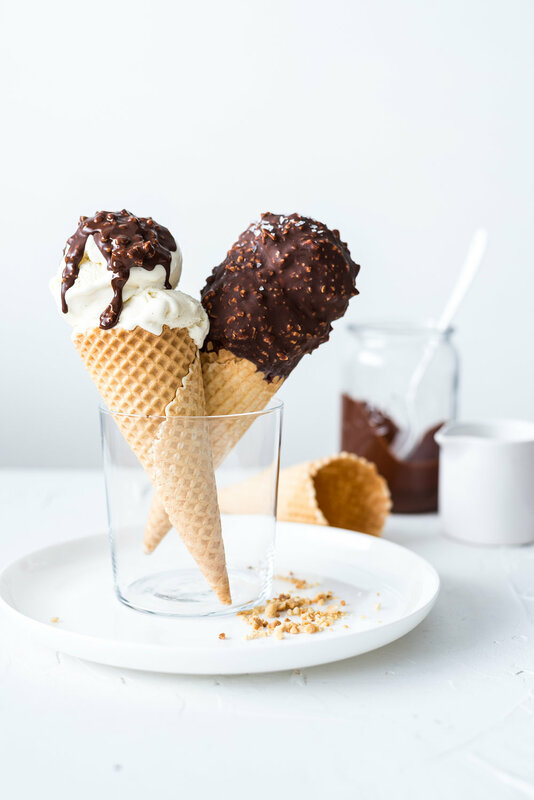 I am all about a no fuss dessert when feeding a crowd - especially if it’s fail proof! Glasses are layered with crushed meringue, tropical fruit, vanilla ice cream and toasted coconut. Salted caramel and cashew ice cream sandwiched between soft and chewy chocolate chunk cookies. Cookies are best kept in the fridge to give them that chewy brownie texture. Crunchy fried sourdough is always a winner in any salad, however the addition of strawberries takes it to a whole new level! A very easy and delicious dish that can be thrown together at the last minute, perfect for summer entertaining. This is a great dish for entertaining a crowd, the salad and sauce can be made in advance and steaks take only five minutes to cook. 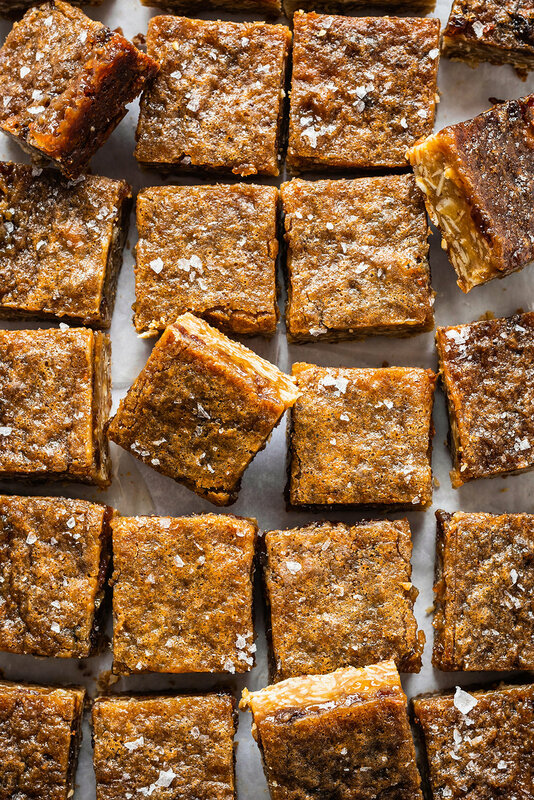 A fabulously chewy toffee slice with a great balance of sweet and salty and soft and chewy. I played with this recipe for a few months before I was totally satisfied with it. It is an adaptation of a great New York Times recipe but I am partial to a chewy base! Tender slow cooked beef stew topped with Castello’s Double Cream Chilli cheese, encased in buttery puff pastry. A perfect way to beat these cold winter nights. Start the day off with this Smokey Hummus breakfast bagel topped with red onion, avocado and a crispy fried egg. Fluffy steamed buns stuffed with hoisin pork belly and ginger. Pork buns are much easier than you might think, although they do require a bit of organisation. Marinate the pork the night before for extra flavourful filling. 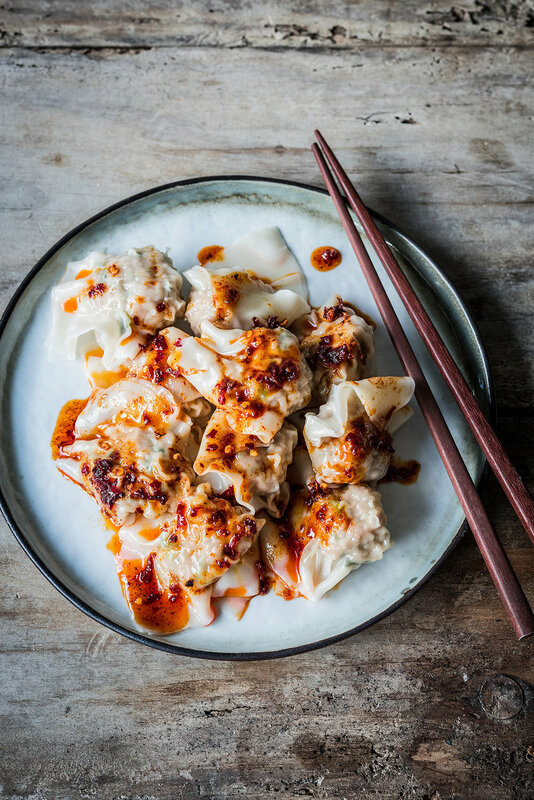 Really easy and delicious pork and coriander wontons with black vinegar and chili oil. Ridiculously soft and chewy spiced cookies with chunks of crystallised ginger. It is very important that the cookie dough is chilled for the full 2 hours before baking otherwise they will spread too much - they are well worth the wait! Creamy garlic and mushroom fettuccine with a crunchy sourdough crumb. Perfect for a cold winters night with a glass of red wine! Delicious brioche style hot cross buns stuffed with spices, raisins and apple. Glaze with crab apple jelly or other yummy jelly and sprinkle over a generous helping of cinnamon and sugar! I served this cake to my guests on our wedding day. It is incredibly orangey and moist and only contains a few ingredients! It also happens to be gluten free. A great make ahead cake as it stays incredibly moist, best kept in the fridge.